Virtual Storage Access Method (VSAM) is one of the access methods used to process data. Many of us have used VSAM and work with VSAM data sets daily, but exactly how it works and why we use it instead of another access method is a mystery. 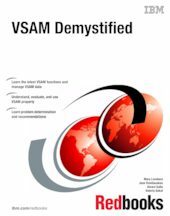 This book helps to demystify VSAM and gives you the information necessary to understand, evaluate, and use VSAM properly. This book also builds upon the subject of Record Level Sharing and DFSMStvs. It clarifies VSAM functions for application programmers who work with VSAM. The practical, straightforward approach should dispel much of the complexity associated with VSAM. Wherever possible an example is used to reinforce a description of a VSAM function. This IBM® Redbooks® publication is intended as a supplement to existing product manuals. It is intended to be used as an initial point of reference for VSAM functions.